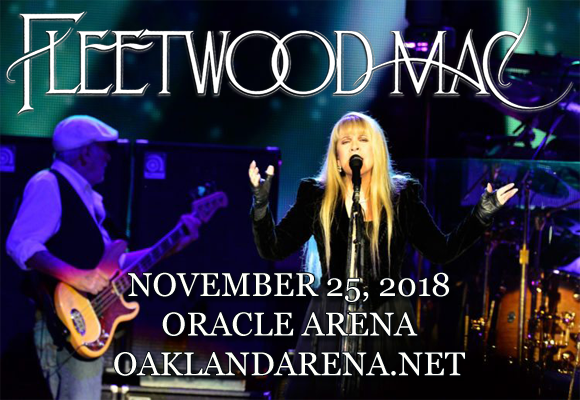 A band that needs no introduction: Fleetwood Mac are coming to Oracle Arena on Sunday 25th November 2018! The chart-topping hit-makers are taking to the stage once more this summer, and with Mike Campbell (Tom Petty and the Heartbreakers) and Neil Flynn (Crowded House) in tow! The iconic group will be performing a bevvy of hits from their back-catalog, including some rarities and surprises – a must for any Mac fan! Formed in 1967 in London, England, Fleetwood Mac are a British-American rock band and one of the best-selling bands of all time. Founded by guitarist Peter Green, drummer Mick Fleetwood and guitarist Jeremy Spencer, the band was initially a British blues group, whose biggest hit was the 1968 UK number one single "Albatross". Over the years, personal problems sparked several changes in line-up and, subsequently, musical direction. With a line-up of Lindsey Buckingham (guitar, vocals), Stevie Nicks (vocals), Christine McVie (keyboards, vocals), John McVie (bass guitar) and Mick Fleetwood (drums), the band found huge success with a more pop-oriented album, Rumours (1977), which is the eighth-highest-selling album of all time. The band experienced several more personnel changes over the years and, as of 2018, the band consists of Stevie Nicks (vocals), Christine McVie (keyboards, vocals), John McVie (bass guitar), Mick Fleetwood (drums) and guitarists Mike Campbell, formerly of Tom Petty and the Heartbreakers, and Neil Finn, formerly of Split Enz and Crowded House.